Vibrant yellow blossoms have a sweet, mild zucchini flavor & great tender texture. The tiny attached veggie has a crunchy texture with a fresh zucchini taste. Make a wonderful appetizer by stuffing with cheese and herbs, dipping in batter and either frying or baking. 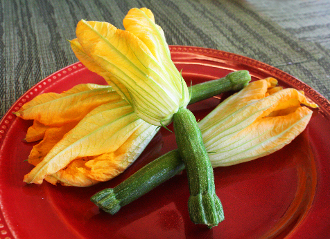 The flowers and zucchinis are also great for topping pizza and a tasty ingredient in pasta. About 6" in length.